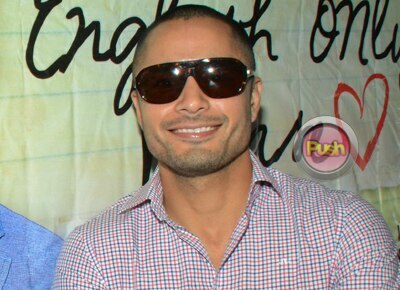 After news of his upcoming project with Star Cinema’s sister film company Skylight Films broke out, curiosity spiked as to the details of it especially since Derek Ramsay himself shared that he was about to have a meeting with the director about almost two weeks ago. However in an interview with Derek during the recently-concluded press premiere of his upcoming Metro Manila Film Festival entry English Only Please, he shared that he wasn’t able to make it to the said meeting. “I wasn’t at the meeting, I wasn’t able to make it. Have you heard of the thing called traffic in the Philippines?’ he joked. “Hindi, pero nag-meeting si Direk Toto [Natividad] at tsaka si Joji [Dingcong, his manager] last week and I think they want to shoot at the end of January,” he added. While the script was already handed to him, Derek remains unassertive about the project. “I’d love to work again with Star Cinema, I just didn’t want know if it’s true. I don’t want to be disappointed. But they sent me the script and I know Direk Toto. Direk Toto was my first director ever,” he said. But who would be his leading lady in case the project pushes through? “Sabi nila baka si Isabelle Daza na bagong lipat yata ng channel 2. But again I don’t want to put my expectations way up here. I wanna be positive and think na matutuloy ‘to but I’m also preparing myself na baka ‘di matuloy,” he underscored. Meanwhile, in a previous interview, Derek shared that his contract with his mother network is set to end by next year. While he formerly said that he will prioritize what the network would offer him before taking on negotiations with other networks, Derek’s mind has seemingly changed of late. “They said they’re gonna renew so diba sabi ko nga sa inyo ako ‘yung nagiisip kung renew or pack-up nako sa industriya,” he said. “I don’t know. I’m just thinking. I have responsibilities to my endorsements and all of that which I treat them like family so when I say pack up it’s not like I’m completely shunning myself away from showbiz but. I don’t know, I’m gonna think about it during the Christmas holiday. If I should enter the next chapter of my life. Baka maybe this is the reason why I can’t find the right girl,” Derek said. Before anyone could presume that he is considering taking a break from the limelight after his turbulent legal battle with his ex-wife Mary Christine Jolly, Derek quickly underscored that such is not the case.